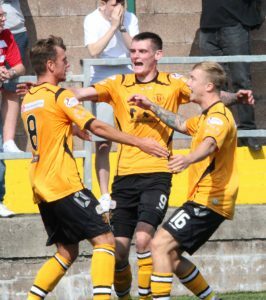 There were a few upsets in the opening round on the Befred Cup ties but none more so than Annan’s impressive victory and performance against Championship side Hamilton Academicals at a sun drenched Galabank on Saturday afternoon. The Galabank Stadium has not been the happiest hunting ground for Hamilton and once again they fell short, despite having a large percentage of the play they failed to penetrate a resolute Annan defence. The more the game went on the more you had the feeling that a goal would be enough to win the match and so it proved when Aidan Smith was introduced in the 60th minute and almost immediately the impressive Smith connected with a Ryan Sinnamon corner to prod the near post cross into the net to send Annan into a winning position. The opening half saw Hamilton playing with the stiff wind in their favour and the best chance of the half fell to Annan striker Tommy Muir in the 7th minute when a mix up in the Hamilton defence ended with the ball at the feet of the Annan striker who showed little composure when striking the ball over the bar from 12 yards. Annan then had a piece of good fortune in the 9th minute when Hamilton broke down the left ending with Rakish Bingham’s deflected effort crashing off the outside off the base of the post and into the hands of Annan keeper Alex Mitchell. This apart goal scoring opportunities were few and far between. Minutes later the Mickel Miller’s effort sailed over the bar. The second half started well for Hamilton and Alex Mitchell was relieved to see Thomas Taiwo’s shot come cross sail past the upright with the Annan keeper beaten. Mitchell however had to be alert when dealing with Bihgham’s header in the 55th minute as Hamilton pressed forward in an effort to open the scoring. On loan Norwich striker Masson Bloomfield headed past the post in the 57th minute as the visitors prodded and probed to penetrate the Annan defence. The defining moment in the match came with the fresh introduction of Aidan Smith in the 60th minute and within a minute the energetic Smith got the important touch to Ryan Sinnamon’s near post corner and although the ball may have taken a touch on route to the net off one of the Hamilton defenders it was Smith who was taking the plaudits. The Annan striker was then denied in the 73rd minute when Muir unlocked the Hamilton defence to put Aidan Smith one on one with keeper Gary Woods who pulled off an important save and minutes later Annan were fortunate when Rakish Bingham’s header crashed off the cross bar. Annan finished the match on the attack when Smith weaved his way in from the right causing defenders to commit but the final effort failed to match the fine run. It was the final action in this Betfred Cup tie. It will be interesting to see how Annan approach Tuesday nights encounter against Berwick Rangers who will provide a different challenge especially after the effort that the players put into this match. In the other match in this section Kenny Millers Livingstone lifted the points with a 2-1 victory over Airdrieonians to make them favourites to top the table. Annan – Alex Mitchell, Scott Hooper, James Creaney, David Wilson, Ayrton Sonkur, Steven Swinglehurst, Tony Wallace ( Aidan Smith 60 min) , Tommy Muir, Scott Roberts, Chris Johnston. Subs not used Robbie Minto, Peter Watson, Owen Moxon, Peter Murphy. Hamilton – Gary Woods, Aaron McGowan, Scott McMann, Ziggy Gordon, Douglas Imrie ( Aaron Smith 79 min), Rakish Bingham, Mickel Miller, Thomas Taiwo, Mason Bloomfield ( Ross Cunningham 70 min), Alexander Penny, Darion Mackinnon, Subs not used Ronan Hughes, Shaun Want, Darrion Lyon, Lennard Sowath, Ryan Fulton . Referee – David Munro Assistants – David Roome and Kevin McEhinney.